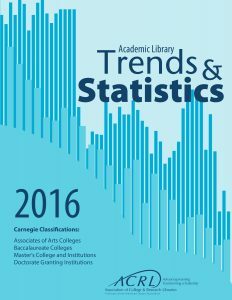 CHICAGO – The Association of College and Research Libraries (ACRL) announces the publication of “2016 Academic Library Trends and Statistics,” the latest in a series of annual publications that describe the collections, staffing, expenditures and service activities of academic libraries in all Carnegie classifications. The one-volume title includes data from Associate of Arts Colleges, Baccalaureate Colleges, Master's Colleges and Universities, and Research/Doctoral-granting Institutions. Those who purchase the print edition will receive a complimentary one-year subscription to the 2016 survey data available through ACRL Metrics, an online subscription service that provides access to the ACRL survey data from 1999-2016. The 2015 data show that library expenditures for collection materials averaged $5,623,980 for doctoral degree-granting institutions; $701,778 for comprehensive degree-granting institutions; $493,206 for baccalaureate schools and $148,822 for associate-degree granting institutions. On average, doctoral degree granting institutions spent 70.9% of their materials budgets on ongoing commitments to subscriptions in 2016; comprehensive schools spent an average of 79.2%; baccalaureate schools spent an average 74.2% and associate degree granting institutions spent an average of 55.2%. On average, academic libraries spent 69.8% of their materials budget on subscriptions. The 2016 data show that expenditures for salaries and wages accounted for 57.2% of the total library expenditures on average. Salaries and wages constituted 76.5% of total library expenditures for associate-degree granting institutions, 52.3% for baccalaureates, 55.7% for comprehensive schools, and 44.5% for doctoral/research institutions. In the past five years, 21% of all academic libraries saw increases for staffing while 19% saw decreased funding and 60% reported flat budgets. During the same time period, almost 61% of academic libraries re-purposed and/or cross-trained staff to better support new technologies or services in the libraries or provide support new positions or departments in the library. Retirements and budget constriction were also factors influencing the need for re-purposing and cross-training. The top five systems/projects currently supported by academic libraries include web development, open access/institutional repositories, learning systems, digital humanities, and digital media production. Academic libraries also provide specialized assistance in these top six areas: copyright, metadata, data management, research impact, instructional design, and data visualization. In the past five years more than 58% of all academic libraries surveyed have their reference staffing models, with the most popular change being a switch to on-call staffing. Libraries are providing staff and other forms of support to many campus services including writing centers (42%), tutoring (39%), testing (25%), diversity and equity (12%), and digital scholarship labs (11%). The survey also provides analysis of selected variables and summary data (high, low, mean and median) for all elements. The 2016 data can be used for self-studies, budgeting, strategic planning, annual reports, grant applications, and benchmarking. “2016 Academic Library Trends and Statistics” is available for purchase through the ALA Online Store, by telephone order at (866) 746-7252 in the U.S., or (770) 442-8633 for international customers.